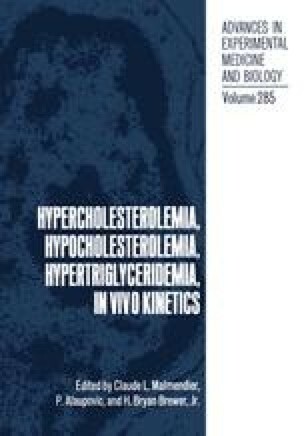 Plasma high density lipoproteins (HDL) and their major proteins — apolipoprotein (apo) AI and apo All — are subnormal in most patients with familial hypertriglyceridemia. However, the pathophysiology of low plasma apo AI and apo All is unclear. The kinetic parameters (turnover) of HDL apo AI and apo All were studied in six lean patients with primary HDL deficiency associated with familial hypertriglyc eridemia and normolipidemic healthy controls. The radioactivity decay curve of 125I labelled HDL was used for assessment of kinetics. Mean plasma apo AI and apo All were significantly lower (p<0.001) in patients than normals (70.4± 2.7 v 106.9± 7.0; 24.2 ± 1.6 v 39.2 ± 0.9 mg/dl, respectively). The mean fractional catabolic rates (FCR) obtained from plasma 125I-HDL, apo AI, apo All radioactivity decay curves and by Berson and Yalow’s method (urine/plasma radioactivity ratios) were significantly greater (p< 0.05) in patients than in controls (0.387 v 0.299; 0.391 v 0.309; 0.361 v 0.275; 0.272 v 0.207/ d; respectively) . The synthetic rates (SR of apo AI and apo All were significantly lower in patients than in controls (11.12 v 14.17 mg/ kg body weight/d. p < 0 . 05; 3.53 v 4 . 68 mg/kg body weight/d, p < 0.05, respectively) . Each patient was also investigated for HDL and triglyceride metabolism immediately before and after 8 wk of gemfibrozil (1200 mg/d) treatment. Gemfibrozil significantly increased plasma HDL cholesterol, apolipoprotein (apo) AI, and apo All by 36%, 29%, and 38% from baseline, respectively. Plasma TG decreased by 54%. Gemfibrozil increased synthetic rates of apo AI and apo All by 27% and 34%, respectively, without changing the FCR. Stimulation of apo AI and apo All synthesis by gemfibrozil was associated with the appearance in plasma of smaller (and heavier) HDL particles as assessed by gradient gel electrophoresis and HDL composition. Postheparin extra-hepatic lipoprotein lipase activity increased significantly by 25% after gemfibrozil, and was associated with the appearance in plasma of smaller very low density lipoprotein particles whose apo CIII:CII ratio was decreased. Hepatic triglyceride lipase was unchanged by treatment. These data indicate that the low HDL (and apo AI and All) in these patients is the result of increased catabolism and decreased synthesis. Gemfibrozil increases the subnormal synthetic rate of apo AI and All without influencing the FCR. We suggest that increased turnover ( flux, transport) of apo AI (whose major function is to efflux tissue cholesterol) by gemfibrozil may be significant in increasing reverse cholesterol transport in such patients with HDL deficiency.